(Note) No live weapons were permitted inside the exercise area. This included no firearms, no ammunition, no tasers, no knives, no batons/clubs, and no chemicals. (Responding Police carried Inert [simulated] Firearms). All responders went through a safety check point, where they were checked prior to entering the exercise area, to make sure that no live weapons were introduced into the exercise environment. The Mock Shooter was equipped with a rifle, adapted to fire blanks, to provide sound stimulus (Sounds of Gunfire) during the exercise. The Mock Shooter and rifle were checked to make sure that no live ammunition was carried into the exercise area. The Controller/Safety Officer assigned to the Mock Shooter maintained constant surveillance of the Shooter, and their immediate area, to ensure their safety from outside threats, and to make sure that the blank adaptor was maintained in proper position at all times. EKU PUBLIC SAFETY IS PLANNING A FULL-SCALE ACTIVE SHOOTER EXERCISE FOR TUESDAY JULY 25TH FROM 9AM TO 1PM. THE EXERCISE WILL TAKE PLACE IN COATES BUILDING, JONES BUILDING, JONES LOT, CRABBE STREET, AND THE CRABBE STREET LOT. If you are interested in volunteering for the exercise, please contact Gary Folckemer at gary.folckemer@eku.edu. Targeted Violence Training and Safety Briefings will be held on the following dates and times in the Brock Auditorium of the Coates Building. Each session will last about 30 minutes. Anyone wishing to volunteer for the exercise is required to attend one of these sessions. Volunteers are also required to complete an Informed Consent Waiver. Training and Briefing Sessions are open to anyone interested in learning more about what to do during a targeted violence attack. To accommodate exercise activity Crabbe Street will be closed on Tuesday July 25th from 8AM to 2PM. Additionally, the Crabbe Street Lot, the Jones Lot, and parking along Crabbe Street, will be closed from Monday July 24th at 6PM through Tuesday July 25th at 2PM. RICHMOND, Ky. – With most students away for the summer, Eastern Kentucky University Public Safety is planning several events designed to enhance campus safety, culminating with a full-scale exercise involving an active shooter scenario. 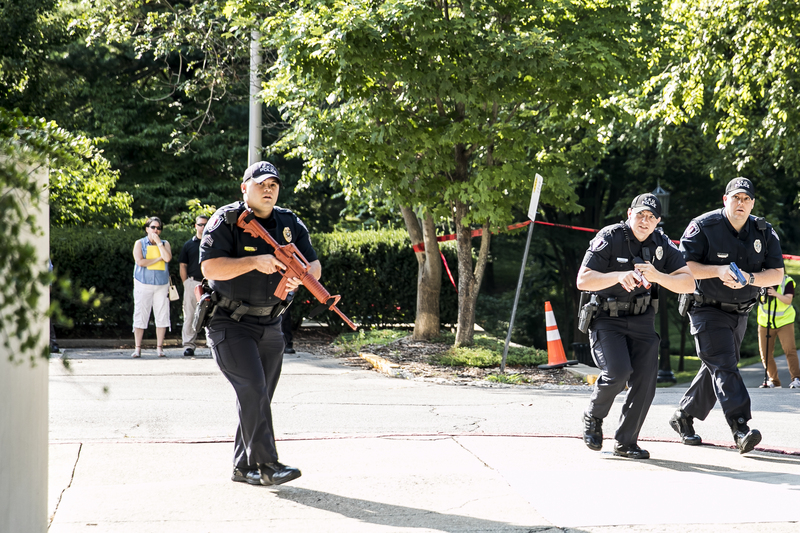 The active shooter exercise will take place on Tuesday, July 25, from 9 a.m. to 1 p.m. in Coates and Jones buildings and adjacent Jones parking lot. The exercise area will also include the Crabbe Street lot, the Ravine and the following campus buildings: Foster, Campbell, Burrier, Roark, Memorial Science, Moore, Cammack and the Alumni Center at Blanton House. Those within the area can expect to hear simulated gunfire and other loud noises, and witness simulated injuries and considerable activity among law enforcement officers. A “soft outer perimeter,” encompassing the area bounded by Crabbe Street, University Drive and Lancaster Avenue will be marked by caution tape and “Police Training in Progress” signs, and a “harder inner perimeter” corresponding to the training area around the Coates and Jones buildings and Jones lot will be marked by police line tape and additional signage. Only Crabbe Street will be closed to traffic during the exercise. Volunteers, including those who work in the Jones and Coates buildings, are needed to portray victims and bystanders. Anyone interested should contact Folckemer at gary.folckemer@eku.edu. Others who work in the two buildings will be given instructions prior to the exercise. · A tabletop exercise related to the active shooter scenario. For more information about the exercise, and you should know about dealing with a targeted violence attack, please visit our Targeted Violence page.